Crataegus pinnatifida fruit, Pinellia ternata rhizome, Massa fermenta, Poria cocos fungus, Citrus reticulata peel, Forsythia suspensa fruit, Hordeum vulgare fruit, Raphanus sativus seed. - Shan zha, Ban xia, Shen qu, Fu ling, Chen pi, Lian qiao, Mai ya, Lai fu zi. Contains tree nuts & wheat. The ingredient Mai ya (Hordeum vulgare) is sprouted barley and may contain gluten proteins. 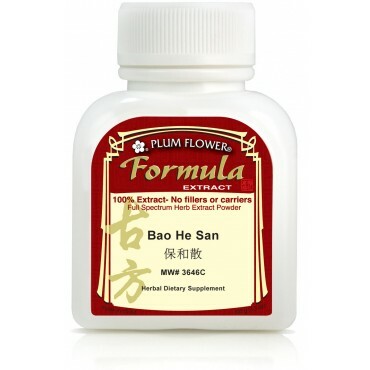 The ingredient Shen Qu (Massa fermenta) is processed with wheat and may contain gluten proteins.